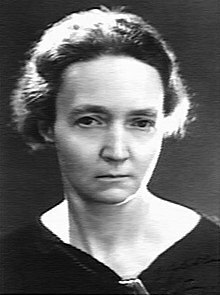 Irène Joliot-Curie (French: [iʁɛn ʒoljokyʁi] ( listen); 12 September 1897 – 17 March 1956) was a French scientist, the daughter of Marie Curie and Pierre Curie and the wife of Frédéric Joliot-Curie. Jointly with her husband, Joliot-Curie was awarded the Nobel Prize in Chemistry in 1935 for their discovery of artificial radioactivity. This made the Curies the family with the most Nobel laureates to date. Both children of the Joliot-Curies, Hélène and Pierre, are also esteemed scientists. Irène was born in Paris, France in 1897 and was the first of Marie and Pierre's two daughters. They lost their father early on in 1906 due to a horse-drawn wagon incident and Marie was left to raise them. Education was important to Marie and Irène's education began at a school near the Observatory. This school was chosen because it had more challenging curriculum than the school nearby the Curie's home. In 1906, it was obvious Irène was talented in mathematics and Marie chose to focus on that instead of public school. Marie joined forces with a number of eminent French scholars, including the prominent French physicist Paul Langevin to form "The Cooperative", which included a private gathering of nine students that were children of the most distinguished academics in France. Each contributed to educating one another's children in their respective homes. The curriculum of The Cooperative was varied and included not only the principles of science and scientific research but such diverse subjects as Chinese and sculpture and with great emphasis placed on self-expression and play. Irène studied in this environment for about two years. Irène and her sister Ève were sent to Poland to spend the summer with their Aunt Bronya (Marie's sister) when Irène was thirteen. Irène's education was so rigorous that she still had a German and trigonometry lesson every day of that break. Irène re-entered a more orthodox learning environment by going back to high school at the Collège Sévigné in central Paris until 1914. She then went onto the Faculty of Science at the Sorbonne to complete her baccalaureate until 1916 where her studies were interrupted by World War I. Initially, Irène was taken to the countryside, but a year later, when she turned 18, she was reunited with her mother, Marie Curie, who was running the twenty mobile field hospitals that she had established. The hospitals were equipped with primitive X-ray equipment made possible by the Curies' radiochemical research. This technology greatly assisted doctors to locate shrapnel in wounded soldiers, but it was crude and led to both Marie and Irène, who were serving as nurse radiographers, suffering large doses of radiation exposure. Both would eventually die from the consequences of accumulated radiation exposure over their professional life. After the war, Irène returned to Paris to study at the Radium Institute, which had been built by her parents. The institute was completed in 1914 but remained empty during the war. Her doctoral thesis was concerned with the alpha decay of polonium, the element discovered by her parents (along with radium) and named after Marie's country of birth, Poland. Irène became Doctor of Science in 1925. As she neared the end of her doctorate in 1924, Irène Curie was asked to teach the precise laboratory techniques required for radiochemical research to the young chemical engineer Frédéric Joliot, whom she would later wed. From 1928 Joliot-Curie and her husband Frédéric combined their research efforts on the study of atomic nuclei . In 1932, Joliot-Curie and her husband Frédéric had full access to Marie's polonium. Experiments were done with the use of gamma rays to identify the positron . Though their experiments identified both the positron and the neutron, they failed to interpret the significance of the results and the discoveries were later claimed by Carl David Anderson and James Chadwick respectively . These discoveries would have secured greatness indeed, as together with J. J. Thomson's discovery of the electron in 1897, they finally replaced John Dalton's model of atoms as solid spherical particles. However in 1933, Joliot-Curie and her husband were first to discover the accurate weight measurement of the neutron . The Joliot-Curie's continued trying to get their name into the scientific community, had developed a new theory. During one of their experiments of using alpha rays against aluminum, they discovered only protons were detected. Based off the undetectable electron and positron pair they proposed the protons changed into neutrons and positrons . Later in October of 1933, this new theory was taken to the Seventh Solvay Conference. The Solvay Conference consisted of highly intelligent scientists in the physics and chemistry community. Irene and her husband presented their theory and results to the fellow scientists, but they received criticism from their finding from most of the 46 scientist attending . However they were able to build on the controversial theory later on. In 1934, the Joliot-Curie's finally made the discovery that sealed their place in scientific history. Building on the work of Marie and Pierre Curie, who had isolated naturally occurring radioactive elements, the Joliot-Curie's realised the alchemist's dream of turning one element into another: creating radioactive nitrogen from boron, radioactive isotopes of phosphorus from aluminium, and silicon from magnesium. Irradiating the natural stable isotope of aluminium with alpha particles (i.e. helium nuclei) results in an unstable isotope of phosphorus: 27Al + 4He → 30P + 1n. This first discover is formally known as positron emission or beta decay, where a proton in the radioactive nucleus changes to a neutron and releases positrons and electron neutrino. By then, the application of radioactive materials for use in medicine was growing and this discovery allowed radioactive materials to be created quickly, cheaply, and plentifully. The Nobel Prize for chemistry in 1935 brought with it fame and recognition from the scientific community and Joliot-Curie was awarded a professorship at the Faculty of Science. Irène's group pioneered research into radium nuclei that led a separate group of German physicists, led by Otto Hahn, Lise Meitner, and Fritz Strassman, to discover nuclear fission: the splitting of the nucleus itself, emitting vast amounts of energy. Lise Meitner's now-famous calculations actually disproved Irène's results to show that nuclear fission was possible. In 1948, using the works of nuclear fission, Irène worked with her husband along with other scientist to create the first French nuclear reactor. Irène's husband, Frédéric was the director of the Atomic Energy Commission, Commissariat à l'énergie atomique (CEA), the organization in charge of the project. The reactor, Zoé (French for "heavy water") used nuclear fission to generate five kilowatts of energy . Years of working so closely with radioactive materials finally caught up with Joliot-Curie and she was diagnosed with leukemia. She had been accidentally exposed to polonium when a sealed capsule of the element exploded on her laboratory bench in 1946. Treatment with antibiotics and a series of operations relieved her suffering temporarily but her condition continued to deteriorate. Despite this, Joliot-Curie continued to work and in 1955 drew up plans for new physics laboratories at the University d'Orsay, south of Paris. The Joliot-Curies had become increasingly aware of the growth of the fascist movement. They opposed its ideals and joined the Socialist Party in 1934, the Comité de vigilance des intellectuels antifascistes a year later, and in 1936 actively supported the Republicans in the Spanish Civil War. In the same year, Joliot-Curie was appointed Undersecretary of State for Scientific Research by the French government, in which capacity she helped in founding the Centre National de la Recherche Scientifique. The Joliot-Curies had continued Pierre and Marie's policy of publishing all of their work for the benefit of the global scientific community, but afraid of the danger that might result should it be developed for military use, they stopped. On 30 October 1939, they placed all of their documentation on nuclear fission in the vaults of the French Academy of Sciences, where it remained until 1949. Joliot-Curie's political career continued after the war and she became a commissioner in the Commissariat à l'énergie atomique. However, she still found time for scientific work and in 1946 became director of her mother's Institut du Radium (Radium Institute). Joliot-Curie became actively involved in promoting women's education, serving on the National Committee of the Union of French Women (Comité National de l'Union des Femmes Françaises) and the World Peace Council. Joliot-Curies were given memberships to the French Légion d'honneur; Irène as an officer and Frédéric as a commissioner, recognising his earlier work for the resistance. 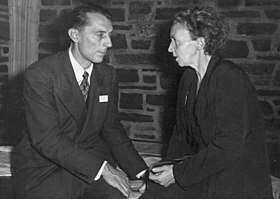 Irène and Frédéric hyphenated their surnames to Joliot-Curie after they married in 1926. Eleven months later, their daughter Hélène was born; she would also become a noted physicist. Their son, Pierre, a biologist, was born in 1932. In 1956, after a final convalescent period in the French Alps, Joliot-Curie was admitted to the Curie hospital in Paris, where she died on 17 March at the age of 58 from leukemia, possibly due to radiation from polonium-210. Frédéric's health was also declining and died in 1958 from liver disease. It was said to be from overexposure to radiation. Joliot-Curie's daughter, Hélène Langevin-Joliot, is a nuclear physicist and professor at the University of Paris; her son, Pierre Joliot, is a biochemist at Centre National de la Recherche Scientifique. Nobel Prize in Chemistry in 1935 for the discovery of artificial radioactivity with Frederic Joliot-Curie. Barnard College Gold Medal for Meritorious Service to Science 1940 with Frederic Joliot-Curie. Her name was added to the Monument to the X-ray and Radium Martyrs of All Nations erected in Hamburg, Germany. ^ "Nobel Laureates Facts: 'Family Nobel Laureates'". Nobel Foundation. 2008. Retrieved 4 September 2008. ^ Hussey, George. "Irene Joliot-Curie". ^ a b c d Hicks, Jennifer (2006). Irène Joliot-Curie. Great Neck Publishing. pp. 1–2. ISBN 9781429808248. ^ a b c d e f Rayner-Canham, Marelene and Geoffrey (1997). Devotion to Their Science: Pioneer Women of Radioactivity. MQUP. pp. 97–123. ISBN 0941901157. ^ Irène Joliot-Curie (12 December 1935). "Nobel Lecture: Artificial Production of Radioactive Elements". ^ Frédéric Joliot (12 December 1935). "Chemical Evidence of the Transmutation of Elements" (PDF). ^ a b Byers; Moszkowski. "Irène Joliot-Curie Contributions and Bibliography". CWP. ^ "Frederic and Irene Joliot-Curie". Encyclopædia Britannica. ^ "Q&A: Polonium-210". Chemistry World. Royal Society of Chemistry. 27 November 2006. Retrieved 4 September 2008. ^ Shelley, Emling. Marie Curie and her daughters : the private lives of science's first family (First ed.). New York. ISBN 9780230115712. OCLC 760974704. ^ "It was to her grandfather, a convinced freethinker, that Irène owed her atheism, later politically expressed as anticlericalism." Joliot-Curie, Irène. Complete Dictionary of Scientific Biography. 2008. Encyclopedia.com. 17 March 2012. ^ Denis Brian. The Curies: A Biography of the Most Controversial Family in Science. Wiley. p. 389. ISBN 9780471273912. There were no prayers: Irene was deeply atheist. Wikimedia Commons has media related to Irène Joliot-Curie. Opfell, Olga S. (1978). The Lady Laureates: Women Who have Won the Nobel Prize. Metuchen, N.J. & London: Scarecrow Press. pp. 165–182. ISBN 0810811618.